This truly South-African side dish will be a hit at your next braai. Combine the melted butter, basil, sugar and spices in a mixing bowl. Place each cob of corn in it’s own sheet of foil. Brush each cob of corn generously with the butter mixture. Place the corn cobs on the braai and cook for about 20 minutes, making sure to turn the cobs often or they will burn. Transfer the corn to a serving dish and place a small knob of butter and a little fresh basil on each cob. Wrap 1 or 2 pieces of rindless bacon around each of the cobs before you wrap them in foil and roast on the grill over the fire for about 20 minutes. Pork fillet is lean, delicious and much more affordable than beef fillet. Here I stuffed it with dried pears and blue cheese, but you can use any filling you like. To make the stuffing, crumble the cheese into a medium mixing bowl and set it aside. Chop the pears roughly on a chopping board and add the pears to the bowl. Add the chives and mix well with a large spoon. Set it aside. Line a roasting tin with a Wizbake Baking Sheet and place a few silicon food ties on the sheet. Place about ten strips of bacon on the food ties so that the bacon overlap a little. See photo below. Place one of the fillets on the bacon and remove or add bacon if necessary. Season the fillet with salt and freshly ground black pepper. Spoon the stuffing onto the fillet and flatten it with the back of the spoon. 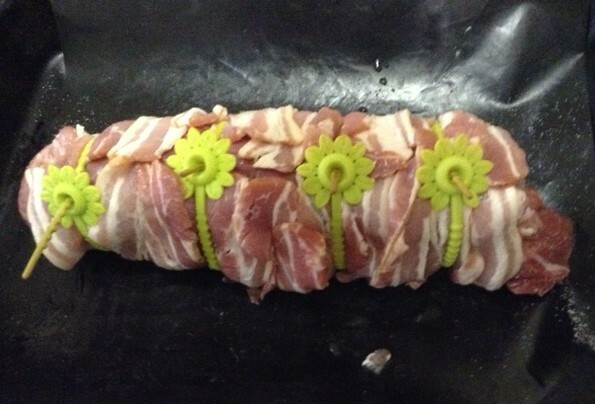 Place the 2nd fillet on top of the stuffing and enclose the fillet with the bacon strips. Close the food ties to secure the fillets. Brush the outside of the “roll” with a little olive oil and roast for 50 to 60 minutes. To make the gravy, pour the pan juices into a measuring jug and fill it up to 375 ml with milk or half milk, half white wine. Add the stock powder and flour to the saucepan and add a little of the liquid. Stir with a spatula to get rid of any lumps. Add the rest of the liquid and stir to mix well. Reheat the pork in an oven preheated to 160 º C covered with foil. An attractive and different way to serve firm white fish. This is a great recipe to adapt to your family’s likes and dislikes by adding fruit and vegetables your family likes. Dice the fish into 25 mm chunks and divide it between 8 plates, one for each kebab. Drain the apricots and reserve the syrup. Pour the syrup in a measuring jug and fill up with water to 375 ml and set aside. Divide the apricot halves and bacon rashers between the plates as well. See the peppers and cut into square sections (20 x 20 mm). Divide the pepper squares between the plates. Place two mushrooms on each plate. Cut the onion in half, separate the layers, cut into sections and divide between the plates. 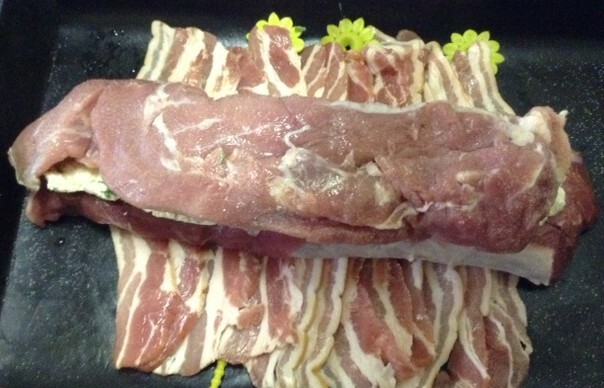 To thread each skewer, start with a bacon rasher and alternate the remaining portions of food, Folding the bacon in a zig-zag manor between the portions. Thread the diced fish and whole mushrooms alone between the zig-zagged bacon, but combine the onion, apricot and peppers before folding over the bacon. Do not push each portion to the end of the skewer, it will move backwards automatically while threading. Place the kebabs in a shallow glass or tupperware dish large enough to hold them in a single layer. Combine the ingredients for the marinade in a mixing bowl and mix well. 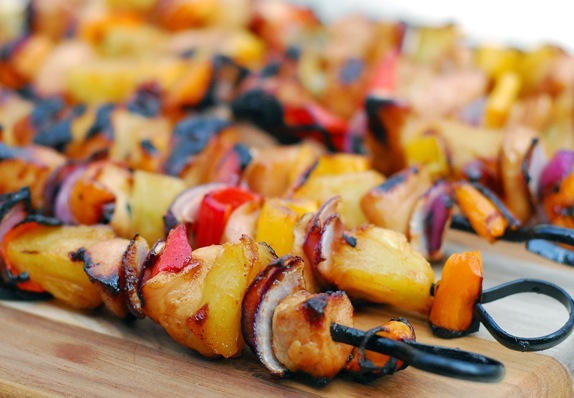 Pour the marinade over the kebabs and marinate for at least two hours or up to 12 hours before grilling. Turn over from time to time. Prepare the sauce in the mean time. Melt the butter in a medium saucepan and stir in the cake flour, curry powder and reserved syrup and water mixture away from the heat. Cook on a medium heat until thickened. Stir in the sultanas or raisins, vinegar and pepper and simmer gently for 5 minutes. Grill about 100 mm away from the element, 6 to 8 minutes on each side until the kebabs are a golden colour or cooked. Take care while grilling to ensure that the fish does not dry out too much or the vegetables scorched. Line a large serving platter or individual plates with rice and arrange the kebabs on top. Spoon over a little of the sauce and serve the rest in a separate bowl. Recipe by Carolié de Koster from the Art Of Cooking p. 174. This vegetarian recipe can be served as a starter or side dish. Wipe the mushrooms with absorbent kitchen paper and remove the stems. Combine the cream cheese, blue cheese, salt and pepper in a bowl. Divide the cheese mixture evenly between the mushroom. Cut each slice of bacon in half so that you have 12 pieces and wrap a piece of bacon around each mushroom. Place a toothpick into the mushroom where the bacon ends overlap. Pack the mushrooms in a single layer on a roasting pan and roast for 5 to 7 minutes or until the bacon is crispy and the filling bubbly. The mushrooms can also be cooked on a braai. This flavoursome and effortlessly browned roast lamb would be perfect to serve with another meat course. To make the basting sauce, combine the ingredients in a mixing bowl, cover with clingfilm and refrigerate until required. Place the meat in a heavy-oven-roasting pot and pour the sauce over the meat. Cover with a lid or foil and bake at 160º C for 1.5 hours or until the meat is tender but not dry. Baste the meat with the sauce and add a little water if necessary to prevent it from scorching. Remove the lid and bake uncovered until the meat is browned to taste. Carve the lamb into thin slices and serve with vegetables and mashed potatoes or on fresh bread with salad ingredients such as lettuce, tomato, cucumber, etc. Recipe by Carolié de Koster from the Art Of Cooking recipe book p. 200.